File a report immediately if you have had LASIK of any other elective refractive surgery and are experiencing any complications or side effects. I strongly encourage to collect copies of all of your medical records and any additional communications you have with your doctors. Get everything in writing! I cannot provide you with any medical or legal advice as I am not a doctor or an attorney, but I can help you fill out a report if needed. You can also read some of the reports I have filed with the Texas Optometry Board and Texas Medical Board Here for reference. Below are copies of some of the complaints I have submitted to the Texas Optometry Board and to the Texas Medical Board regarding the dishonest, unethical, and illegal actions of Tom Ballard, OD and Larry R. Taub, MD. My experience thus far is that these these two agencies are worthless and ineffective when it comes to protecting the public. One of the Texas Optometry Board's own members, Randall Reichle, OD of Eye Center of Texas has even been warned by the FDA to stop displaying misleading LASIK advertisements. I have informed the optometry board Here and asked them to take action and remove Dr. Reichle from the board. A few statements have been removed from the posted copies of the complaints so that they would be more appropriate for public disclosure. I have also removed the names of some doctors who we not responsible for damaging my vision and that attempted to help me after my vision was damaged. Supplement to initial complaint to the Texas Optometry Board * Chris Kloeris, Executive Director of the Texas Optometry Board refused to provide this information to Dr. Ballard for his response. Dr. Ballard's response to the optometry board * Submitted by Dr. Ballard to the board prior to review of the supplement I submitted to the optometry board that Chris Kloeris refused to act on. Appeal to the optometry board * The Texas Optometry Board does not have an official appeals process. Kris Kloeris refused to allow me to address board members in person to appeal. Additional complaint filed with the Texas Optometry Board and Texas Medical Board This complaint was limited to the single topic of not receiving the procedure I paid for. I worded this complaint in a manner would have made it difficult or impossible for Dr. Ballard and Dr. Taub to weasel out of. This was also written just prior to me finding that optometry board member Randall Reichle, OD was warned by the FDA to stop misleading LASIK advertising. Again, Kris Kloeris refused to follow up on this complaint. He simply stated that it was already addressed. False Advertising complaint submitted to the optometry board with screen captures of First Eye Care Dallas false patient satisfaction reviews. Letters sent to all First Eye Care Associates. I strongly encourage you to avoid ALL First Eye Care Facilities in Texas where Tom Ballard, OD serves on the board of directors. I sent a letter to all First Eye Care doctors listed on the First Eye Care website warning them of Dr. Ballard's illegal, dishonest, misleading, and unethical treatment of LASIK patients and how it does not align with the First Eye Care corporate philosophy of "Vision Made Clear". So far I have not received a single response to the nearly 50 letters sent. Maybe they all share the same lack of values as Dr. Ballard. You've heard the saying "Birds of a feather flock together". Letter sent to Tom Ballard, OD ensuring that he is well of aware of his actions and how they affected me as his patient. My experience is that your reports will not result in any action against the doctor responsible for your injuries. You should file it anyway so that there is a paper trail. Playing nice will get you no where. My advise is to picket your doctor's office. They can and will ignore complaints. They will not be able to ignore a patient standing in front of their practice with a sign. 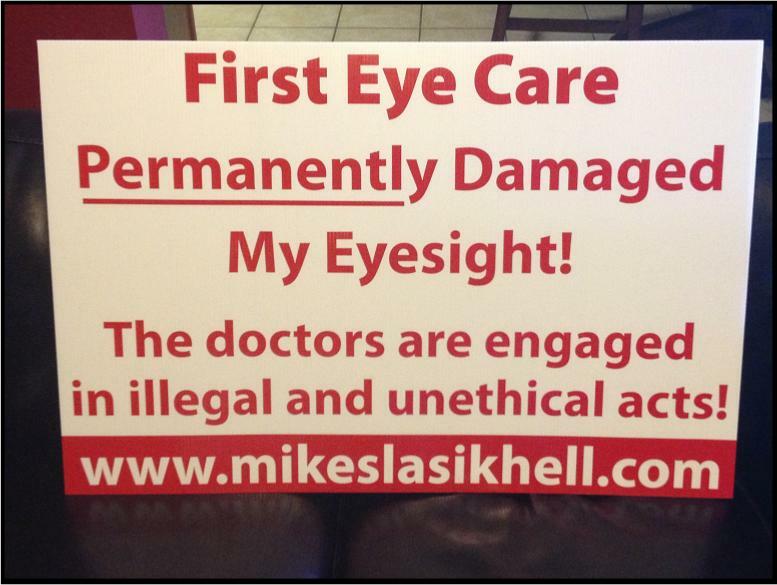 Your sign can be simple and state " XYZ Eye Care Permanently damaged my vision" or "LASIK permanently damaged my vision". Add your website if you have one. The doctors have permanently injured you. Don't be afraid to stand up for yourself and for others! Warn others that your doctor has permanently injured you. Just obey the law while picketing. Expect that the police may show up. This is not a bad thing. An educated officer will recognize that you are exercising your rights and will allow you to continue. An uneducated officer may ask that you leave. If they ask you to leave then you should do so. Immediately after leaving you need to contact the ACLU and inform them that your civil rights have been violated. They will help you. Below is an image of one of my signs. 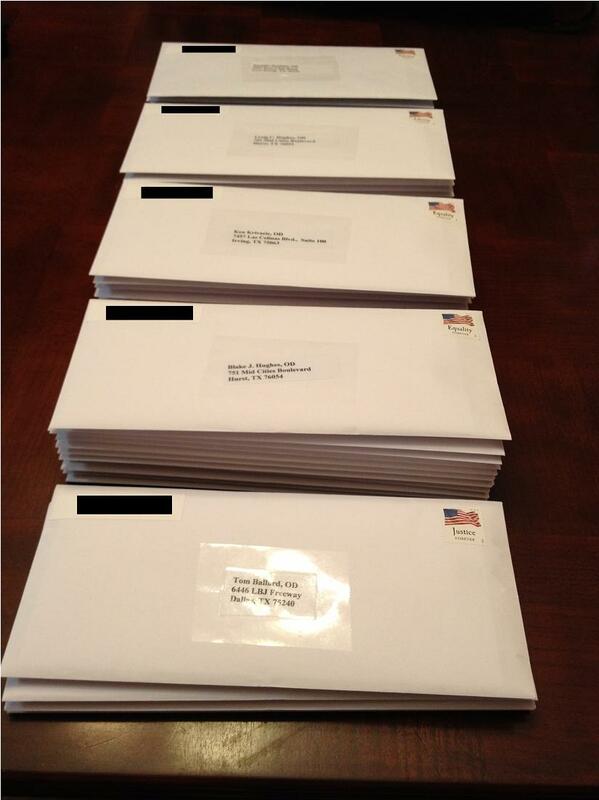 Below is an image of nearly 50 letters sent out to Tom Ballard, OD and all First Eye Care doctors listed.